Featuring self-draining design for making quick and easy inspection and diaphragm change, ASEPCO Weirless Radial Diaphragm™ Valves are suitable in sterilization processes. Designed with integral travel stops and radial shoulder seal, units feature 180° flow path and offers drainability in multiple orientations without leakage. Made from solid 316L stainless steel and AL6XN or Hastelloy materials, valves are serialized and laser-etched for full traceability. Watson-Marlow Fluid Technology Group (WMFTG) announces ASEPCO Weirless Radial diaphragm™ valves, contamination-free technology that eliminates dead legs and cross-contamination. With integral travel stops and a patented radial shoulder seal, the ASEPCO in-line valves offer complete isolation of process fluids. Weirless Radial diaphragm valves offers the installation flexibility necessary to enable the most compact skid possible, thereby optimizing processing for efficient sterilization in place (SIP) processes. Bioprocessors can optimize their bottom line by achieving quicker throughput, since smaller and more compact systems require less time to get up to temperature and achieve sterilization. The ASEPCO Weirless valves feature a clean, self-draining design with an easy-to use clamp assembly to make inspection and diaphragm change quick and easy. 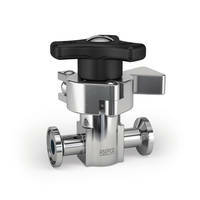 The valves are easy to seal and inspect and never need retightening or adjustment. No tools are required for maintenance. Unlike typical weir-style diaphragm valves that require a variety of hardware, including nuts, bolts, and studs, the clamp design is far simpler to assemble, reducing change time from as much as 20 minutes down to a minute. This reduces maintenance costs by up to 80 percent. ASEPCO Weirless Radial diaphragm valves offer a number of advantages over ordinary weir-style diaphragm valves, which can introduce product entrapment and leakage and result in higher maintenance requirements. They are contamination-free and feature a 180° flow path, with superior drainability in multiple orientations without leakage. The valves feature high-end actuators with numerous options, including a control interface that enables users to use the weirless valve to control flow in process lines. Machined from solid 316L stainless steel (other materials are available, such as, AL6XN or Hastelloy) each valve is serialized and laser-etched for full traceability. The valves meet ASME BPVC, ASME BPE and CE-PED standards.